American engineer mission specialist astronaut 1978-1986. Engineer. Died in Challenger accident. Status: Deceased; Active 1978-1986. Born: 1949-04-05. Died: 1986-01-28. Spaceflights: 2 . Total time in space: 6.04 days. Birth Place: Ohio. Resnik revolted against her parents wishes to become an electrical engineer. She was smart, hardworking, and dependable.. 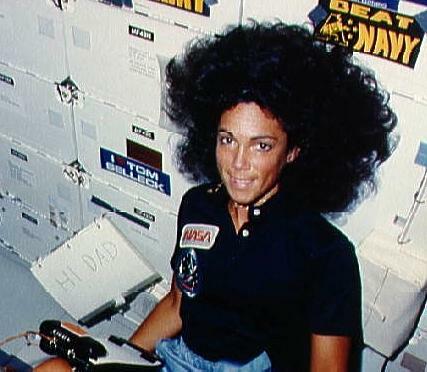 Her enormous halo of hair, floating in zero-G, made for some memorable pictures from her first shuttle mission. It also snagged in the works of the IMAX camera aboard the mission, having to be cut out with scissors. Luckily the camera could be put back into operation, and the commercially-funded footage could be shot without too great a loss. She was briefly married and divorced before becoming an astronaut. At one point she was stalked by a NASA subcontractor employee. Repeated complaints to NASA management and the contractor were of no avail until the stalker actually showed up at her desk in Houston, at which point action was finally taken. Resnik was nicknamed Jane by Mullane after she dubbed Hawley and Mullane Cheetah and Tarzan after their fawning encounter with Bo Derek during the filming of Tarzan the Ape Man. PERSONAL DATA: Born April 5, 1949, in Akron, Ohio. Died January 28, 1986. Unmarried. She was a classical pianist and also enjoyed bicycling, running, and flying during her free time. EDUCATION: Graduated from Firestone High School, Akron, Ohio, in 1966; received a bachelor of science degree in Electrical Engineering from Carnegie-Mellon University in 1970, and a doctorate in Electrical Engineering from the University of Maryland in 1977. ORGANIZATIONS: Member of the Institute of Electrical and Electronic Engineers; American Association for the Advancement of Science; IEEE Committee on Professional Opportunities for Women; American Association of University Women; American Institute of Aeronautics and Astronautics; Tau Beta Pi; Eta Kappa Nu; Mortarboard; Senior Member of the Society of Women Engineers. SPECIAL HONORS: Graduate Study Program Award, RCA, 1971; American Association of University Women Fellow, 1975-1976. NASA Space Flight Medal, 1984. EXPERIENCE: Upon graduating from Carnegie-Mellon University in 1970, she was employed by RCA located in Moorestown, New Jersey; and in 1971, she transferred to RCA in Springfield, Virginia. Her projects while with RCA as a design engineer included circuit design and development of custom integrated circuitry for phased-array radar control systems; specification, project management, and performance evaluation of control system equipment; and engineering support for NASA sounding rocket and telemetry systems programs. She authored a paper concerning design procedures for special-purpose integrated circuitry. Dr. Resnik was a biomedical engineer and staff fellow in the Laboratory of Neurophysiology at the National Institutes of Health in Bethesda, Maryland, from 1974 to 1977, where she performed biological research experiments concerning the physiology of visual systems. 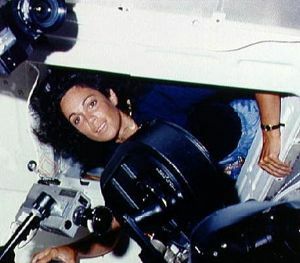 Immediately preceding her selection by NASA in 1978, she was a senior systems engineer in product development with Xerox Corporation at El Segundo, California. 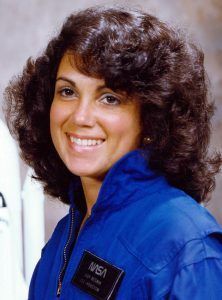 NASA EXPERIENCE: Selected as an astronaut candidate by NASA in January 1978, she completed a 1-year training and evaluation period in August 1979. Dr. Resnik worked on a number of projects in support of Orbiter development, including experiment software, the Remote Manipulator System (RMS), and training techniques. Dr. Resnik first flew as a mission specialist on STS 41-D which launched from the Kennedy Space Center, Florida, on August 30, 1984. She was accompanied by spacecraft commander Hank Hartsfield, pilot Mike Coats, fellow mission specialists, Steve Hawley and Mike Mullane, and payload specialist Charlie Walker. This was the maiden flight of the orbiter Discovery. During this 7-day mission the crew successfully activated the OAST-1 solar cell wing experiment, deployed three satellites, SBS-D, SYNCOM IV-2, and TELSTAR 3-C, operated the CFES-III experiment, the student crystal growth experiment, and photography experiments using the IMAX motion picture camera. The crew earned the name "Icebusters" in successfully removing hazardous ice particles from the orbiter using the Remote Manipulator System. STS 41-D completed 96 orbits of the earth before landing at Edwards Air Force Base, California, on September 5, 1984. With the completion of this flight she logged 144 hours and 57 minutes in space. Dr. Resnik was a mission specialist on STS 51-L which was launched from the Kennedy Space Center, Florida, at 11:38:00 EST on January 28, 1986. The crew on board the Orbiter Challenger included the spacecraft commander, Mr. F.R. Scobee, the pilot, Commander M.J. Smith (USN), fellow mission specialists, Dr. R.E. McNair, and Lieutenant Colonel E.S. Onizuka (USAF), as well as two civilian payload specialists, Mr. G.B. Jarvis and Mrs. S. C. McAuliffe. The STS 51-L crew died on January 28, 1986 when Challenger exploded after launch. Judith A. Resnik was born on April 5, 1949 at Akron, Ohio, the daughter of Dr. Marvin Resnik, a respected Akron optometrist, and Sarah Resnik. Brought up in the Jewish religion, Resnik was educated in public schools before attending Carnegie-Mellon University, where she received a B.S. in electrical engineering in 1970, and the University of Maryland, where she took at Ph.D. in the same field in 1977. Resnik worked in a variety of professional positions with the RCA corporation in the early 1970s and as a staff fellow with the Laboratory of Neurophysiology at the National Institutes of Health in Bethesda, Maryland, between 1974 and 1977. Selected as a NASA astronaut in January 1978, the first cadre containing women, Resnik underwent the training program for Shuttle mission specialists during the next year. Thereafter, she filled a number of positions within NASA at the Johnson Space Center, working on aspects of the Shuttle program. Resnik became the second American woman in orbit during the maiden flight of Discovery, STS-41-D, between August 30 and September 5, 1984. During this mission she helped to deploy three satellites into orbit; she was also involved in biomedical research during the mission. Afterward, she began intensive training for the STS-51- L mission on which she was killed. Departed Date: 1986-01-28. Cause of Death: Challenger explosion.. Degree: PhD. Marital Status: divorced. Education: Carnegie Mellon;Maryland. Family: Astronaut. Country: USA. Flights: STS-12, STS-41-D, STS-51-L. Projects: STS. Bibliography: 12, 4457, 5932. 1949 April 5 - . Birth of Dr Judith Arlene 'JR' Resnik - . Nation: USA. Related Persons: Resnik. American engineer mission specialist astronaut 1978-1986. Engineer. Died in Challenger accident. 2 spaceflights, 6.0 days in space. Flew to orbit on STS-41D (1984)..
1986 January 28 - . Death of Judith Arlene 'JR' Resnik - . Related Persons: Resnik. American engineer mission specialist astronaut 1978-1986. Engineer. Died in Challenger accident. 2 spaceflights, 6.0 days in space. Flew to orbit on STS-41D (1984)..
1986 January 28 - . 16:38 GMT - . Launch Site: Cape Canaveral. Launch Complex: Cape Canaveral LC39B. Launch Platform: MLP2. LV Family: Shuttle. Launch Vehicle: Space Shuttle. FAILURE: Seal on SRB failed, allowed hot gas to burn through External Tank.. Failed Stage: 0. STS-51-L - . Call Sign: Challenger. Crew: Jarvis, McAuliffe, McNair, Onizuka, Resnik, Scobee, Smith. Payload: Challenger F10 / TDRS 2 [IUS]. Mass: 116,670 kg (257,210 lb). Nation: USA. Related Persons: Jarvis, McAuliffe, McNair, Onizuka, Resnik, Scobee, Smith. Agency: NASA. Program: STS. Class: Manned. Type: Manned spaceplane. Flight: STS-51-L. Spacecraft Bus: Shuttle. Spacecraft: Challenger. Duration: 0.0008 days. Decay Date: 1986-01-28 . Apogee: 15 km (9 mi). Exploded 73 seconds after launch, all 7 crewmembers were killed; carried TDRSS satellite..